Identification. In 1493, Christopher Columbus landed on an island he named Santa Cruz. Driven away by the Carib Indians, he sailed northward to a nearby group of islands he called Las Once Mil Virgenes, in honor of Saint Ursula. The French took Santa Cruz from Spain in 1650, renaming it Saint Croix. The towns of Christiansted and Frederiksted on Saint Croix and Charlotte Amalie, the capital, on Saint Thomas were founded by the Danes and named after Danish royalty. Location and Geography. The country lies seventy miles east of Puerto Rico, in the Lesser Antilles of the Caribbean, and is composed of three large and fifty small islands totaling 136 square miles (352 square kilometers). Saint Croix, the southernmost and largest island, has land suitable for agriculture. Saint Thomas, forty miles to the north, has the highest point on the islands, with little tillable land. With a good port at Charlotte Amalie, it became a commercial center with reliance on the slave trade. The smallest of the main islands, Saint John, was donated by Laurence Rockefeller in 1956 as a national park. In 1996, Water Island, off the southern coast of Saint Thomas, was officially added to the country. Demography. In 1999, the population was estimated at 120,000. The main population groups are West Indian (74 percent born in the Virgin Island,s and 29 percent born elsewhere), United States mainland (13 percent), Puerto Rican (5 percent) and others (8 percent). Blacks constitute 80 percent of the population, whites 15 percent, and others 5 percent. Linguistic Affiliation. English is the official language. A Dutch Creole, Negerhollands, arose in the seventeenth century on Saint Thomas from interactions between Dutch planters and African slaves and spread to Saint John and Saint Croix. In the next century, German missionaries translated the Bible into that language. With emancipation and the influx of English Creole speakers from other islands, the use of Dutch Creole declined. An English Creole arose on Saint Croix and is still spoken, although its use is generally limited to older islanders. The United States takeover in 1917 resulted in American English becoming the standard administrative, educational, and economic language. "Virgin Islands English," which retains some Creole features, is widely used in personal and informal situations. Spanish has become increasingly important because of immigration from nearby islands; Spanish speakers make up 35 percent of the population of Saint Croix. Symbolism. The territorial bird is the indigenous yellow breast, and the territorial flower is the yellow elder, commonly called "Ginger Thomas." The flag, adopted in 1921, is white with a yellow American eagle grasping three arrows in its left talon and with an olive branch in its right, between the blue initials "V" and "I." On its breast is a shield of the United States. suppressed the slave trade in 1803, the practice did not end until the British occupied the islands in 1807. The islands were returned to Denmark in 1815 and remained the Danish West Indies until their purchase by the United States in 1917. Originally under the control of the navy, they passed to the Department of the Interior in 1954. National Identity. Many documents from the colonial period are in Denmark, not accessible to residents seeking to study the country's history. Since 1917, there has been a lot of migration to and from the islands to other parts of the Caribbean and to the mainland; until recently, less than half of the population was native-born. People emphasize the variety of cultures in the islands, and the advantage of being both "U.S." and "Caribbean." Ethnic Relations. The first elected black governor in the United States, Melvin Evans, took office in 1970. Relations between ethnic groups are generally good, although there has been some racial violence. Basic Economy. Per capita income is high, but the cost of living is expensive and there is constant pressure for new jobs. A major economic problem at the beginning of 1997 was the high level of governmental debt; since that time, expenditures have been cut, revenues have been increased, and fiscal stability has been restored. An increase in the tax on rum is expected to increase revenues. The islands' lack of natural resources makes them dependent on imports for local consumption and later reexportation. The basic unit of currency is the U.S. dollar. Commercial Activities. The retail sector, including hotels, bars, restaurants, and jewelry stores, accounts for nearly half of the islands' revenues. The service sector is the largest employer; a small but growing area is financial services. Construction increased after the hurricanes of 1995. Tourism is the primary economic activity, accounting for more than 70 percent of the gross-domestic product and 70 percent of employment. Around two million tourists visit the islands annually; two-thirds are cruiseship passengers, but air visitors account for the majority of tourism revenue. Agriculture has declined in importance. 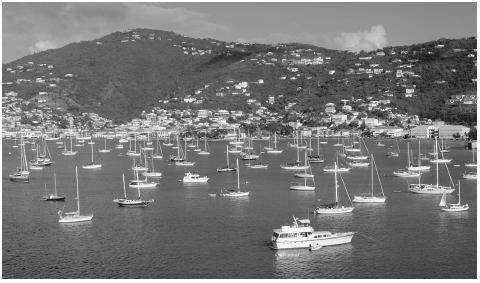 Boats in the Charlotte Amalie Harbor, Saint Thomas. Two million tourists visit the islands annually; two-thirds of them are cruiseship passengers. Politeness is considered important. Children are told to address adults as "sir" or "ma'am." Visitors are encouraged to smile, use greetings, and maintain a courteous attitude. Religious Beliefs. The predominant religious affiliations are Baptist (42 percent), Catholic (34 percent), and Episcopalian (17 percent). Remnants of African culture are found in the belief in spirits. Religious Practitioners. Under Danish rule, the Lutheran church was the state church; to practice any other religion, an official permit had to be granted. Permits were granted fairly easily, and sermons were not censored. With the coming of the Americans in 1917, the Catholic Redemptorists became the predominant religious order, and Catholicism was a major force through the 1940s, in terms of the influence which priests wielded over parishioners. 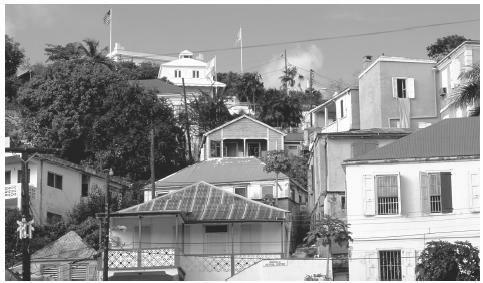 The colonial style architecture of Charlotte Amalie, Saint Thomas. European and African cultures have influenced local architecture. former slaves built the All Saints Cathedral. The Arawak Indian carvings on Saint John may have religious significance. There are hospitals on Saint Croix and Saint Thomas and a clinic on Saint John. Alternative healing methods are widely used, such as faith healing, chiropractic, and traditional "bush" remedies based on indigenous plants. Support for the Arts. A nine-member Arts Council and a thirteen-member Historic Preservation Commission are appointed by the governor. Community arts groups exist on all three islands, with private support from a number of sources. Literature. The Caribbean Writer, sponsored by the University of the Virgin Islands, showcases local writers. Lezmore Emanuel, a folk composer and poet; the literary historians Adelbert Anduze and Marvin Williams; and the poets Gerwyn Todman, Cyril Creque, J. P. Gimenez, and J. Antonio Jarvis have all made significant contributions. Graphic Arts. The most famous locally born painter, Camille Pissaro, was born on Saint Thomas but moved to Paris. A number of contemporary artists work outside the country. Tourist preference has influenced the development of visual arts; Caribbean themes predominate in local galleries, such as the Caribbean Museum Center on Saint Croix. Performance Arts. Mocko Jumbie stilt dancers perform at festivals and celebrations. Mocko Jumbies are masked and wear straw hats with cutouts for the eyes and mouth. This clothing was traditionally a woman's dress, but long trousers have become an acceptable part of the costume. The figure symbolizes the spirit world, and so the entire body must be disguised. Small decorative mirrors are worn to indicate invisibility. The stilts give the dancer additional height to frighten away evil spirits and also allow the Mocko Jumbie to chase misbehaving children and to keep crowds back from parade routes. The Reichhold Center for the Arts, the Island Center Theater, and the Caribbean Community Theater give dance, music, and theater performances. Groups such as the Saint Croix Heritage Dancers and the Caribbean Dance Company preserve and teach traditional folk dances, many with African roots. The traditional folk dance, the quadrille, dates back to eighteenth century European settlers. The University of the Virgin Islands maintains an Agricultural Experiment Station, a Cooperative Extension Service, and the William P. MacLean Marine Science Center. Its Eastern Caribbean Center conducts social, survey, and environmental research. The Virgin Islands Ecological Research Station on Saint John provides support services for visiting scientists and students. Corbett, Karen Suzanne. "An Ethnographic Field Study of Infant Feeding Practices in St. Croix, United States Virgin Islands." Ph.D. dissertation, University of Texas, Austin, 1989. Domingo, Jannette O. "Employment, Income and Economic Identity in the U.S. Virgin Islands." Review of Black Political Economy 18 (1):37–57, 1989. Fallon, Joseph E. "The Ambiguous Status of the U.S. Insular Territories." The Journal of Social, Political and Economic Studies 23 (2):189–208, 1998. Jno-Finn, John. "The Current State of Multicultural Education in the Virgin Islands." Ph.D. dissertation, Vanderbilt University, 1997. Martel, Arlene R. USVI: America's Virgin Islands, 1998. Nicholls, Robert W. "The Mocko Jumbie of the U.S. Virgin Islands: History and Antecedents." African Arts 32 (3): 48–71, 1999. Olwig, Karen Fog. "Caribbean Place Identity: From Family Land to Region and Beyond." Identities 5 (4): 435–67, 1999. Richards, Heraldo Victor. "An Investigation of the Relationship between Virgin Islands English Creole Usage and Reading Achievement among Third, Fifth, and Seventh Graders in the United States Virgin Islands." Ph.D. dissertation, Northwestern University, 1993. Simmonds, Ruby. "The Words Beneath the Sand: An Examination of the Works of Three Virgin Islands Poets." Doctor of Arts in Humanities dissertation, Clark Atlanta University, 1995. Willocks, Harold. The Umbilical Cord: The History of the United States Virgin Islands, 1995. ——. Massacre in Paradise, 1997. You had everything I needed except sports and things to see and do!!!... thanks to you I should get a good grade on this homework I used this informationtion to help me complete!!! THANKS!!! this is a good artical but i need to help my daughter find an artical about 3 main carribean tourist attractions and facts on them but i did enjoy reading this. I think that is a good aritcle article. I got a lot of information on my own island. So now is can say a lot about my island. Wow! This is a lot of useful information. I am a student at UVI and everything you printed we discussed in Social Science class. This is a good means of assisting students with information for their reports. I found this to be a very informative page. Being that I no longer live in the VI, I often get questions from people about the island, and I realized that's I really didn't know much about the island. Thanks for taking the time to construct this helpful tool. Nice to see good things about the virgin island. I am from St.Croix it is always good to see positive things about the Virgin Island. I love my home. Tourist are welcomed we give you open arms when you visit us. Come and enjoy what the islands have to offer. Thank you soo much this is very good information. I have done a tone of research about the V.I. and this is the best I ahave found so far. ireally appreciate it. I'm doing a presentation and this helped me so much...It's great information!!! I love my island also! you should come and visit, especially for carnival time. Very good article. I learned quite a bit about the islands. I monved to St. Thomas about 2 years ago so, it was nice to read good things aobut it. But, I felt that the amount of violence the islands are facing was a little sugar-coated. The article was somewhat helpful however I desired more information on the beliefs and norms of the people. I'm doing a soiciological paper trying to categorize how the people of V.I. operate, what's considered acceptable or unaccepatable in you culture, the norms, folkways of the people. I think this is beautiful and it portrays the cultural aspect of the Virgin Islands which is very good. I am from the VI. I work at a public elementary school in Florida. 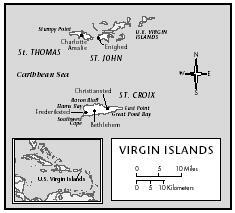 I am gathering information to present to a group of student about the Virgin Islands. I must say this is so much more than I expected to find. I am well on my way to an awesome presentation. Thank you!!! I need a little bit more information but this is a good site. Great, informative article! You provided a variety of in depth, well written information. The article was OK. I just want to know what the heck is Killaloo? Its called Callaloo!! That reminds me of this TV show I watched when the lady called our Johnny Cakes, Journey Cakes. Get the names right!! FOR ALTERNATIVE NAME, PLEASE ADD ST.THOMIAN TO THOMIAN. THANKS, RESPECTFULLY. The biggest holiday on St Croix is St Patricks Day. Why is this? I found this article very informative. My only disappointment was there was no information concerning profression employment. I am planning to relocate to St. Thomas from North Carolina sometimes in late November 2017.